Lewis Hamilton says winning his second world title is the start of "something special" for himself and Mercedes. 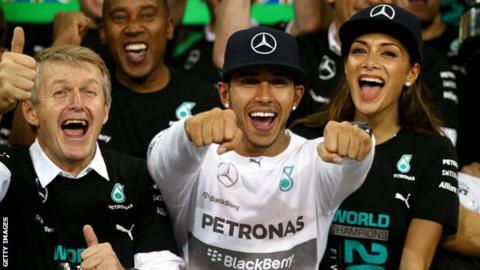 He joined Mercedes in 2013 after non-executive chairman Niki Lauda promised they would make him world champion. After winning Sunday's Abu Dhabi Grand Prix to clinch the title, Hamilton, 29, said: "I wanted to be part of something building and growing. "I feel this is just the beginning. What this team has put together is something incredibly special." Hamilton won the title by 67 points after a tense season-long battle with team-mate Nico Rosberg. He is one of seven men to win the championship twice, leaving him one behind three-time victors Sir Jack Brabham, Sir Jackie Stewart, Lauda, Nelson Piquet and Ayrton Senna. Alain Prost and Sebastian Vettel are the only four-time winners, Juan Manuel Fangio has five, while Michael Schumacher leads the way with seven. Hamilton continued: "We've got great people in their right positions and me and Nico will continue to push the team forward. "As will the boss of Mercedes, who has been so committed and building the best engine. These guys know just as much as I do, it's been phenomenal this year. "It's really important the steps we take moving forwards to continue improving and I 100% believe the team will do that." Team-mate Rosberg signed a new contract with Mercedes until at least the end of 2016 in May this year, while Hamilton has a contract with Mercedes until the end of next year. He and the team delayed negotiations over a new deal until the title had been decided so Hamilton could concentrate on his racing. Mercedes F1 boss Toto Wolff has said they will sit down in the coming days and discuss the new deal and both Stevenage-born Hamilton and his team expect to continue together into a new contract. Hamilton said: "I definitely don't feel I am looking for a new challenge. We have a year to go, so there's no particular rush but this is my home and I'm very happy here." Mercedes non-executive chairman Lauda added: "I asked him to leave McLaren and come to Mercedes and he said 'when are we going to be competitive'. I said I could guarantee him a world championship and in the second year here it is. "We are going to do this [contract] in the next two weeks. He's happy, we're happy, I don't see any issues."